Focused on jolly co-operation, the Warriors of Sunlight appear as gleaming golden spirits, beacons of light and a welcome sign for players who need aid against tough bosses. Defeat bosses as a White-Gold Phantom or defeat hosts as a Red-Gold Phantom to earn Sunlight Medals. 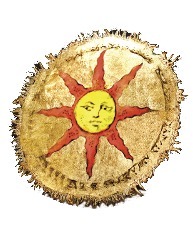 You can join the Warriors of Sunlight by locating their emblem early in the game, not too far into the Undead Settlement. Their shrine is not found until much later in the game in Lothric Castle.